The Sacramento River Cats had just lost the lead in Thursday's game when they responded in a record-setting way. The Triple-A Giants affiliate scored a franchise-best 13 runs in the top of the seventh in Thursday's 17-7 win over the Colorado Springs Sky Sox at Security Service Field. The frame fell three runs shy of the Pacific Coast League record, set by Salt Lake City on Aug. 18, 1923. 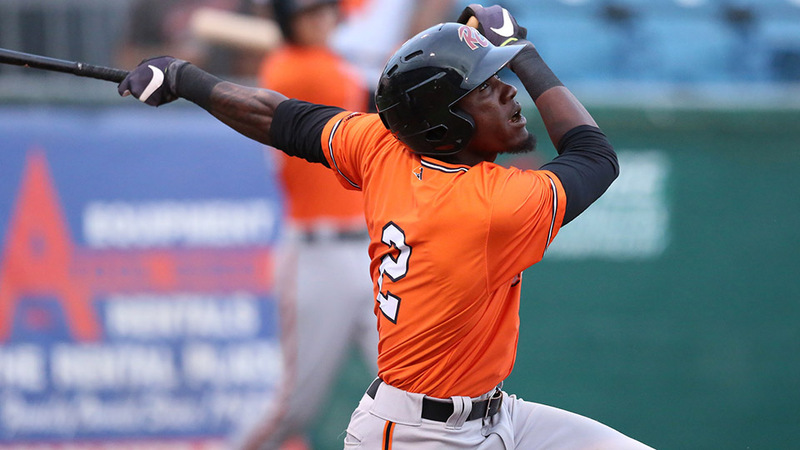 Leadoff man Orlando Calixte was the star of the game for the River Cats, setting career highs with five hits and 12 total bases, homering twice for the second time this season and driving in a season-high four runs. His first long ball cleared the center-field fence to lead off the sixth inning and tied the game, 2-2. He contributed to the record an inning later with an RBI double to left and beat out an RBI single to third. He led off the ninth with his second homer of the game to right-center, taking advantage of the 17-mph wind blowing out to right. The dinger was his sixth of the year after he blasted 11 in 126 games across two levels in 2016. Sacramento's first seven batters reached base in the seventh with Calixte's double driving in Juniel Querecuto two batters after the shortstop walked to lead off the frame. Giants No. 18 prospect Austin Slater followed with a two-run double to center to knock Sky Sox right-hander Tyler Cravy out of the game. Fellow right-hander Tim Dillard walked the first two batters he faced before Tim Federowicz doubled to score two. Dillard allowed a sacrifice fly to Pedro Ciriaco, hit Wynton Bernard, gave up an RBI single to Querecuto and walked Kyle Blanks before exiting in favor of David Goforth. The righty gave up Calixte's RBI single and another two-run double to Slater. Chris Marrero followed with a three-run homer to right-center to end the record-setting frame. Federowicz reached four times on the day -- three hits and one walk -- and plated three to join Calixte, Slater and Marrero with at least three RBIs for Sacramento. The four drove in 14 of Sacramento's 17 runs. No. 20 San Francisco prospect Dan Slania gave up five runs on two hits and four walks with three strikeouts over five innings, and right-hander Roberto Gomez (1-2) picked up the win in relief after allowing one run on two hits and striking out two in an inning. Sky Sox first baseman Garrett Cooper smacked a grand slam and drove in five.